Economy beam trolley / girder trolley is designed specifically to provide quick and versatile rigging or hoisting points for a huge variety of applications. The economy beam trolley available in both push travel (pictured) and geared type in all sizes. Drop forged screw type adjuster enables safe speedy adjustments. Featuring a lightweight rugged construction, using high grade ball bearings for precise and smooth rolling. 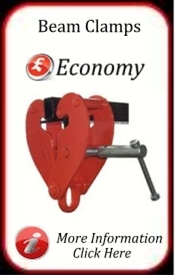 For use with hand and electric hoists. All trolleys are designed with the same capacity as Chain Blocks. Side plates are produced with trolley wheel guards for additional safety. 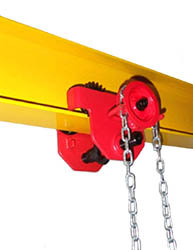 Products supplied under the heavy duty beam trolley / girder trolley range are from the GT and LiftinGear Lifting Equipment Ranges. Products information and pictures shown on this page are provided as guidance only and may vary slightly to the product supplied. It is recommended that you contact us to confirm any crucial product information including measurements and colour before purchasing the item.